The FLYOVER KIT is Pre-cut and designed specifically to fit the sides and hood of 2013 2014 2015 2016 2017 2018 and 2019 Ford EcoSport SUV Sport Utility. 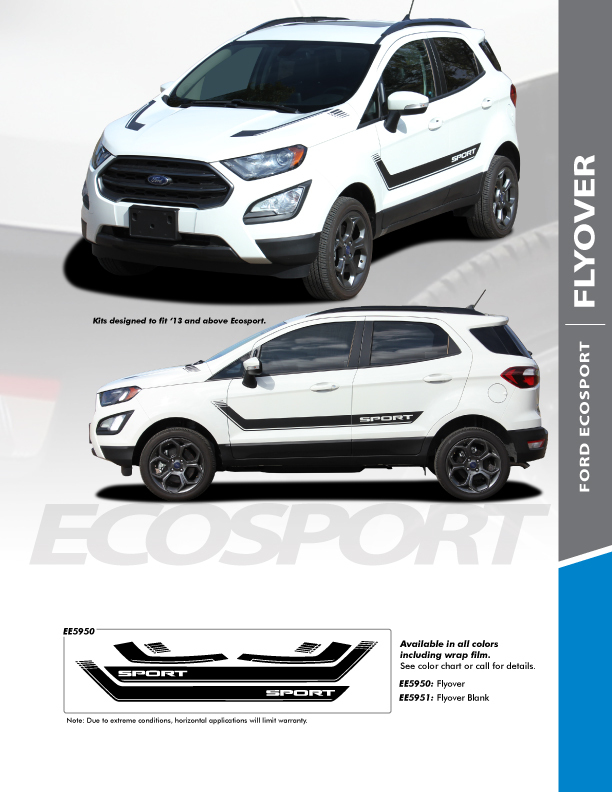 This FLYOVER KIT for Ford EcoSport Vinyl Graphics kit is guaranteed to add OEM style your Ford EcoSport SUV. Don’t delay; ordering the best Ford EcoSport Hood and Side Stripes that money can buy from FastCarDecals.com today. We aim to ship all our vinyl decals and stripes kits out to our customers within 24 hours, so your Ford EcoSport decals and Ford EcoSport Stripes will be with you in no time at all! All our Ford EcoSport Vinyl Graphics Packages are ready to install straight out of the box thanks to our exclusive Cut To Fit Designs. TEXT Us or Email us Today!